There's nothing better than a bowl of hot homemade soup on a cold winter day. 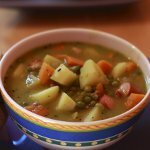 Celebrate National Homemade Soup Day on February 4. It's easy to make a canned soup, but there is nothing like a bowl of fresh homemade chicken noodle or tomato soup. And if you're eager to taste something new, you can find thousands of soup recipes. Soup is as old as the history of cooking itself. Its concept is very simple, that is why combining different nutritious ingredients into a large pot has been used for centuries. Did you know that the Middle English word “soupen” meant “to drink in sips”, that is how most soups were consumed? The modern words “supper”, “soup”, “sop” and “sip” derive from this term. Let us give you some tips on serving your soup. Serve a soup course in demitasse cups instead of bowls. Root vegetable, mushroom, minestrone, French onion, seafood and Thai soups are the best for winter. For summer serve cold soups, like gazpacho, cucumber dill and fruit soup. Enjoy a bowl or cup of homemade soup with your family or friends to celebrate National Homemade Soup Day.